Spectacular Canterbury Cathedral is a must-see when visiting Kent, the "Garden of England". This UNESCO World Heritage Site and popular tourist draw is most famous as the location for the murder of Thomas Becket in 1170, an event that still captivates visitors and pilgrims. As Archbishop of Canterbury, Becket had crossed paths with King Henry II who, in a flagrant abuse of power, commanded a group of his most trusted knights to commit the crime. To this day, it remains a chilling experience to stand in the exact spot where Becket was murdered. There's no better way to begin your visit than by strolling around Canterbury Cathedral's perimeter as you contemplate the many historic figures who walked here before you, including kings and queens, archbishops and writers. Walking the length of the building not only provides perspective in terms of its vast size, it's also an opportunity to check out its many different architectural styles, including its Norman arches, Late Gothic nave and towers. This will be time well spent. As you enter the cathedral via the Southwest Porch you'll instantly be struck by the grandeur of the tall, bright nave and aisles with their cluster pillars, Gothic tracery windows and ornate ribbed vaulting. Note in particular the west window with its extraordinary tracery and 15th century stained glass. The line of pillars on the north side of the nave leads past the font (17th century) and pulpit towards the choir screen dating from 1411. The magnificent stone is work decorated with angels carrying shields and the crowned figures of six monarchs: Henry V, Richard II, Ethelbert of Kent, Edward the Confessor, Henry IV and Henry VI. The Northwest Transept is the site of The Martyrdom, the scene of Thomas Becket's murder on December 29th, 1170. It's also where you'll see the Altar of the Sword's Point, named after the blade of the sword used to kill Becket and which broke due to the force of the blow. The fine stained glass northwest window dating from 1482 depicts Edward IV and his family at prayer. Inside the Ambulatory are sections of the original Norman walls, along with some of the original medieval glass windows. A faded fresco, a relic of the colorful murals that once adorned the cathedral, recounts the story of St Eustace. The Choir Stalls were made in 1682, the Archbishop's Throne in 1840. The St Augustine's Chair, upon which the Archbishops of Canterbury are traditionally enthroned, dates from the 13th century. Canterbury Cathedral boasts an impressive collection of magnificent Tombs. One of the best is that of Archbishop Henry Chichele, founder of All Souls College in Oxford. The Archbishop is represented twice in effigy: first in the full splendor of his robes, and again as a naked corpse, a symbol of the impermanence of earthly possessions. Just a few paces away is the marble tomb of Cardinal Thomas Bourchier (died 1486), staunch supporter of the House of York during the Wars of the Roses. Trinity Chapel was where St Thomas Becket's golden shrine stood (1220-1538), its heavy lid being raised to allow pilgrims a glimpse of the gem-encrusted casket containing his remains. The chapel today houses the alabaster tomb of Henry IV (died 1413) and his wife Joan of Navarre (died 1437). Another famous tomb is that of the Black Prince, aka Edward of Woodstock, the eldest son of King Edward III. A knight in the truest sense, the Black Prince was famous for his pursuit of the English cause during the Hundred Year's War. The walls of the Choir on both sides of the Corona (the circular chapel at the far east end) are embellished with superb late 12th and 13th century stained glass windows. Known as the Miracle Windows, they depict scenes from Thomas Becket's life and are part of a larger series including Old and New Testament subjects (they're also considered the most important medieval stained glass series in England). The Corona itself (aka "Becket's Crown") once housed a reliquary containing a severed fragment of the saint's skull. St Michael's Chapel houses many 15th through 17th century tombs including those of Lady Margaret Holland (1437) with the Earl of Somerset and Duke of Clarence at her side, and Thomas Thornhurst (1627). It's also where you'll find the tomb of Cardinal Odet de Coligny, Huguenot Archbishop of Toulouse, poisoned by a Catholic servant during a visit to England in 1571. Opposite lies Archbishop Hubert Walter (died 1205) on whose shoulders much political responsibility rested in the days of Richard the Lionheart and King John. The large 12th century Norman Crypt is the oldest part of the cathedral. In addition to traces of Romanesque wall paintings, the pillars with their splendidly carved Norman capitals and decorated shafts are also of note. The striking variety of motifs (animals, plant ornamentation, demons) reveals influences from as far afield as Lombardy, Byzantium and the Middle East. Afterwards, finish your tour with a peek into the early 15th century Chapter House with its beautiful barrel vaulting of Irish bog oak, the original setting for T S Eliot's "Murder in the Cathedral" in 1935. The main cathedral tour lasts 40 minutes, and an optional section covering the Great Cloister and Chapter House lasts another 20 minutes. Audio tours are available from the kiosk in the Nave for a small fee. Guided tours are also available daily. Available from the Welcome Centre, tickets for the guided tours cost £5 for adults, £4 for children, or £10 for a family. Buy a Guidebook: A number of excellent guidebooks are available for purchase. These include a step-by-step Short Tour, a 48-page Souvenir Guide, and a 96-page comprehensive guide. Food and Drink: The Coffee Kiosk in the South Precincts is open Apr-Sept and serves snacks, sandwiches and beverages. Staff: Chaplains are on duty at certain times, and a priest is always available - just ask. What's On: To find out more about possible closures, or events that may be of interest during the time of your visit, visit the cathedral's event page. By train: Southeastern Railway operates High Speed rail services from London St Pancras to Canterbury West (about one hour), as well as regular services from London Victoria and London Charing Cross to both Canterbury East and Canterbury West stations, each just a short walk from the Cathedral. 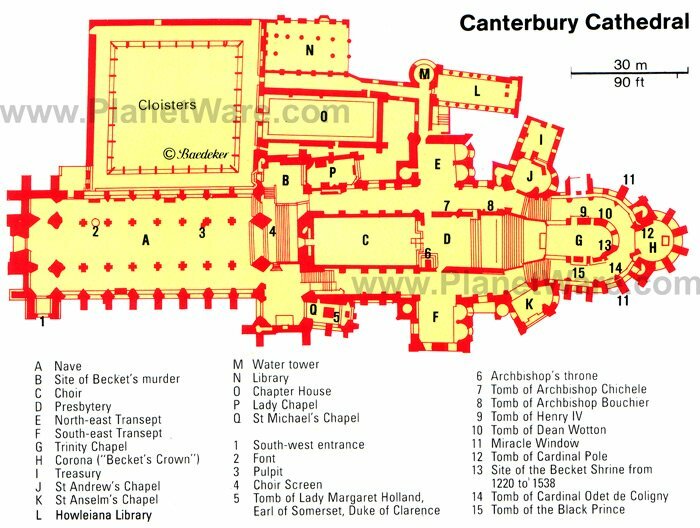 Online discounts are often available, as are special 2-for-1 offers to Kent attractions, including Canterbury Cathedral. In style: Luxury steam train and rail services are sometimes offered to Canterbury from London. Visit http://www.steamdreams.co.uk or http://www.orient-express.com for further info. By coach: Canterbury is served by Stagecoach East Kent from Canterbury Bus Station, a few minutes walk from the cathedral. National Express operates regular coach services from London Victoria Coach Station. By road: Canterbury is well served by the M20 and M2. Parking: Car parks are located in the center of Canterbury, and an excellent Park and Ride scheme operates every few minutes from designated areas on the outskirts of the city. Canterbury Cathedral is part of the Pilgrim's Way, a route for pilgrimages all the way to Winchester via Rochester. In recognition of this still important religious undertaking, priests offer pilgrim blessings to those setting out, and prayers of thanksgiving for those arriving. Contact the cathedral in advance to make arrangements, or ask a staff member upon arrival. For a truly unique experience, plan a stay at Canterbury Cathedral Lodge. Owned by the cathedral, it combines superb views overlooking beautiful gardens and of the cathedral, as well as exclusive access to the Cathedral Precincts. In addition to exploring all the fantastic sightseeing attractions Canterbury has to offer (everything from fantastic museums to Roman ruins and stunning medieval architecture) the city is an excellent starting place from which to explore other parts of Kent. Dover and its spectacular White Cliffs overlooking the English Channel is just a few miles away, as are the coastal resort towns of Folkestone, Margate and Ramsgate. Also close by is Ashford, most notable as the main terminus in Kent for the Channel Tunnel and rail routes to Paris and other European destinations.